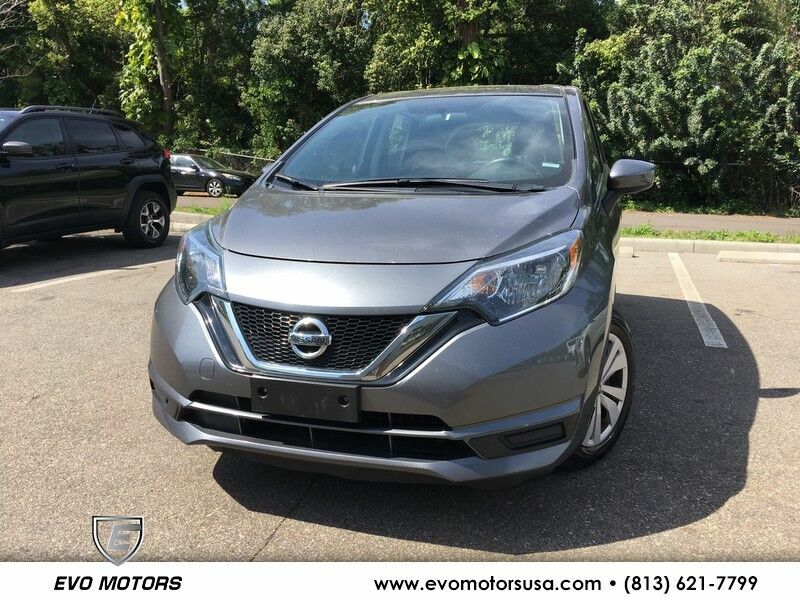 ** CLEAN CARFAX ** 2017 NISSAN VERSA NOTE SV ** ONE OWNER ** BACKUP CAMERA ** Evo Motors is pleased to be currently offering this 2017 Nissan Versa Note SV . The 2017 Nissan offers compelling fuel-efficiency along with great value. You will no longer feel the need to repeatedly fill up this Nissan Versa Note SV's gas tank, in part because of it's superb EPA rating. The look is unmistakably Nissan, the smooth contours and cutting-edge technology of this Nissan Versa Note SV will definitely turn heads. The quintessential Nissan -- This Nissan Versa Note SV speaks volumes about its owner, about uncompromising individuality, a passion for driving and standards far above the ordinary. ** FINANCING AVAILABLE ** CALL 813-621-7799 ************* ORIGINAL PRICE ************* **To receive the lower advertised price or Preferred Payment discounted price purchaser must purchase the vehicle using one of the following preferred payment methods: Cash, Cashiers Check without lien recording instructions, Capital One Auto Navigator pre approval, or Financing through the dealership with an Approved lender. **YOU MAY CONTACT THE DEALERSHIP FOR A LIST OF APPROVED LENDERS **. A list of approved lenders maybe requested by email or talk to a sales representative. If buyer is purchasing the vehicle using any other payment method ORIGINAL price will apply. **All Truecar price certificates will reflect ORIGINAL price** All prices advertised on any Credit union or third party lenders buying service facilitated by third party websites are original prices and not the discounted price. customer may choose to receive the discounted price if they pay for the vehicle with a preferred payment method. ** 2015 NISSAN ALTIMA S ** ONE OWNER ** AND MORE ** High Value Options Bluetooth Connection Keyless Start Power Driver Seat Tire Pressure Monitor ** FINANCING AVAILABLE ** CALL 813-621-7799 ************* ORIGINAL PRICE ************* **To receive the lower advertised price or Preferred Payment discounted price purchaser must purchase the vehicle using one of the following preferred payment methods: Cash, Cashiers Check without lien recording instructions, Capital One Auto Navigator pre approval, or Financing through the dealership with an Approved lender. **YOU MAY CONTACT THE DEALERSHIP FOR A LIST OF APPROVED LENDERS **. A list of approved lenders maybe requested by email or talk to a sales representative. If buyer is purchasing the vehicle using any other payment method ORIGINAL price will apply. **All Truecar price certificates will reflect ORIGINAL price** All prices advertised on any Credit union or third party lenders buying service facilitated by third party websites are original prices and not the discounted price. customer may choose to receive the discounted price if they pay for the vehicle with a preferred payment method. This outstanding example of a 2015 Nissan Sentra SR is offered by Evo Motors. The greater your fuel-efficiency, the less your carbon footprint. And with exceptional MPGs, this Nissan Sentra treads ever so lightly on Mother Earth. With less than 38,024mi on this Nissan Sentra, you'll appreciate the practically showroom newness of this vehicle. More information about the 2015 Nissan Sentra: The Nissan Sentra is better looking and more fuel efficient than ever. Even in the base trim, the Sentra is well-equipped. At the top of the lineup, Nissan includes many premium touches, such as a touch-screen audio system, "Intelligent Key" entry and dual-zone climate control. All this comes in at less than $20,000. Interesting features of this model are handsome new styling, roomy interior, premium tech options, and Excellent fuel economy ** FINANCING AVAILABLE ** CALL 813-621-7799 ************* ORIGINAL PRICE ************* **To receive the lower advertised price or Preferred Payment discounted price purchaser must purchase the vehicle using one of the following preferred payment methods: Cash, Cashiers Check without lien recording instructions, Capital One Auto Navigator pre approval, or Financing through the dealership with an Approved lender. **YOU MAY CONTACT THE DEALERSHIP FOR A LIST OF APPROVED LENDERS **. A list of approved lenders maybe requested by email or talk to a sales representative. If buyer is purchasing the vehicle using any other payment method ORIGINAL price will apply. **All Truecar price certificates will reflect ORIGINAL price** All prices advertised on any Credit union or third party lenders buying service facilitated by third party websites are original prices and not the discounted price. customer may choose to receive the discounted price if they pay for the vehicle with a preferred payment method. ** CLEAN CARFAX ** 2017 KIA FORTE LX ** ONE OWNER ** BACKUP CAMERA ** ALLOY WHEELS On the 2017 Model Kia made updates to the Forte's interior quality, infotainment system, active safety features and horsepower . 2017 models now come with apple carplay and android connect a larger touch screen display All complemented the Forte's existing strengths: spacious seating and cargo space and tons of value. But the Forte's long list of available features and competitive price continue to make it a compelling. Whether it's the strong acceleration, satisfying brake pedal feel or ability to transition from open road to city traffic, the Forte is a genuine surprise. Real development went into this car, and Kia should be applauded for no half-measures. Visit and check out our selection in both locations. Our super low volume pricing saves you thousands. Free carfax reports also extended coverage plans available on all used car inventory that cover up to additional 150k miles and 7 years. RIGINAL PRICE ************* **To receive the lower advertised price or Preferred Payment discounted price purchaser must purchase the vehicle using one of the following preferred payment methods: Cash, Cashiers Check without lien recording instructions, Capital One Auto Navigator pre approval, or Financing through the dealership with an Approved lender. **YOU MAY CONTACT THE DEALERSHIP FOR A LIST OF APPROVED LENDERS **. A list of approved lenders maybe requested by email or talk to a sales representative. If buyer is purchasing the vehicle using any other payment method ORIGINAL price will apply. **All Truecar price certificates will reflect ORIGINAL price** All prices advertised on any Credit union or third party lenders buying service facilitated by third party websites are original prices and not the discounted price. customer may choose to receive the discounted price if they pay for the vehicle with a preferred payment method. ** 2015 NISSAN SENTRA SV ** ONE OWNER ** SUN / MOONROOF ** 1.8 L / 4 CYLINDER ENGINE ** High Value Options: Back-Up Camera, Bluetooth Connection, Keyless Start, Satellite Radio, Tire Pressure Monitor, AND MORE ** FINANCING AVAILABLE ** CALL**813-621-7799 ************* ORIGINAL PRICE ************* **To receive the lower advertised price or Preferred Payment discounted price purchaser must purchase the vehicle using one of the following preferred payment methods: Cash, Cashiers Check without lien recording instructions, Capital One Auto Navigator pre approval, or Financing through the dealership with an Approved lender. **YOU MAY CONTACT THE DEALERSHIP FOR A LIST OF APPROVED LENDERS **. A list of approved lenders maybe requested by email or talk to a sales representative. If buyer is purchasing the vehicle using any other payment method ORIGINAL price will apply. **All Truecar price certificates will reflect ORIGINAL price** All prices advertised on any Credit union or third party lenders buying service facilitated by third party websites are original prices and not the discounted price. customer may choose to receive the discounted price if they pay for the vehicle with a preferred payment method. ** 2016 NISSAN SENTRA S ** ONE OWNER ** High Value Options: Bluetooth Connection, Tire Pressure Monitor, AND MORE ** FINANCING AVAILABLE ** CALL**813-621-7799 ************* ORIGINAL PRICE ************* **To receive the lower advertised price or Preferred Payment discounted price purchaser must purchase the vehicle using one of the following preferred payment methods: Cash, Cashiers Check without lien recording instructions, Capital One Auto Navigator pre approval, or Financing through the dealership with an Approved lender. **YOU MAY CONTACT THE DEALERSHIP FOR A LIST OF APPROVED LENDERS **. A list of approved lenders maybe requested by email or talk to a sales representative. If buyer is purchasing the vehicle using any other payment method ORIGINAL price will apply. **All Truecar price certificates will reflect ORIGINAL price** All prices advertised on any Credit union or third party lenders buying service facilitated by third party websites are original prices and not the discounted price. customer may choose to receive the discounted price if they pay for the vehicle with a preferred payment method. ** 2016 TOYOTA COROLLA ** ONE OWNER ** 1.8 LE / 4 CYLINDER ENGINE ** VALUE ADDED OPTIONS Auxiliary Audio Input Back-Up Camera Bluetooth Connection Heated Mirrors MP3 Compatible Stereo AND MANY MORE FEATURES ** FINANCING AVAILABLE ** CALL 813-621-7799 ** ************* ORIGINAL PRICE ************* **To receive the lower advertised price or Preferred Payment discounted price purchaser must purchase the vehicle using one of the following preferred payment methods: Cash, Cashiers Check without lien recording instructions, Capital One Auto Navigator pre approval, or Financing through the dealership with an Approved lender. **YOU MAY CONTACT THE DEALERSHIP FOR A LIST OF APPROVED LENDERS **. A list of approved lenders maybe requested by email or talk to a sales representative. If buyer is purchasing the vehicle using any other payment method ORIGINAL price will apply. **All Truecar price certificates will reflect ORIGINAL price** All prices advertised on any Credit union or third party lenders buying service facilitated by third party websites are original prices and not the discounted price. customer may choose to receive the discounted price if they pay for the vehicle with a preferred payment method. Contact Evo Motors today for information on dozens of vehicles like this 2015 Nissan Rogue Select S. Do so much more with one vehicle. This Nissan Rogue Select gives you everything you need an automobile to be. This 2015 Nissan Rogue Select has such low mileage it has been parked more than driven. More information about the 2015 Nissan Rogue Select: The Rogue Select's combination of a roomy interior and high roofline combined with secure, car-like handling--and its small-car maneuverability--make it a great choice for small families. The Rogue Select also has more clutter-reducing storage places, including the useful underfloor storage compartment. Fuel economy is good, with a combined rating of 25 mpg on the front-wheel drive version. Pricing starts at just about $20,000. This model sets itself apart with new tech features, Roomy interior, fuel-efficiency, value for the money, cargo-friendly layout and storage options, and maneuverability AND MORE ** FINANCING AVAILABLE ** CALL 813-621-7799 ************* ORIGINAL PRICE ************* **To receive the lower advertised price or Preferred Payment discounted price purchaser must purchase the vehicle using one of the following preferred payment methods: Cash, Cashiers Check without lien recording instructions, Capital One Auto Navigator pre approval, or Financing through the dealership with an Approved lender. **YOU MAY CONTACT THE DEALERSHIP FOR A LIST OF APPROVED LENDERS **. A list of approved lenders maybe requested by email or talk to a sales representative. If buyer is purchasing the vehicle using any other payment method ORIGINAL price will apply. **All Truecar price certificates will reflect ORIGINAL price** All prices advertised on any Credit union or third party lenders buying service facilitated by third party websites are original prices and not the discounted price. customer may choose to receive the discounted price if they pay for the vehicle with a preferred payment method. Check out this gently-used 2017 Volkswagen Jetta we recently got in. High Value Options Back-Up Camera Bluetooth Connection Tire Pressure Monitor Stylish and fuel efficient. It's the perfect vehicle for keeping your fuel costs down and your driving enjoying up. One of the best things about this Volkswagen Jetta is that it has low, low mileage. It's ready for you to truly break it in. More information about the 2017 Volkswagen Jetta: The 2017 Jetta competes with the Honda Civic, MAZDA3 and Toyota Corolla. Volkswagen has worked to give buyers the best of all worlds-- carefully packaging features and tweaking the Jetta's price level. Volkswagen wants buyers to feel they can get a premium German sedan or wagon at a friendly price, with fit and finish similar to that on cars that cost two and three times as much. Strengths of this model include good handling and braking, Affordability, excellent fit and finish, fuel economy, and terrific trunk space. ** AND MANY MORE FEATURES ** FINANCING AVAILABLE ** CALL 813-621-7799 **To receive the lower advertised price or Preferred Payment discounted price purchaser must purchase the vehicle using one of the following preferred payment methods: Cash, Cashiers Check without lien recording instructions, Capital One Auto Navigator pre approval, or Financing through the dealership with an Approved lender. **YOU MAY CONTACT THE DEALERSHIP FOR A LIST OF APPROVED LENDERS **. A list of approved lenders maybe requested by email or talk to a sales representative. If buyer is purchasing the vehicle using any other payment method ORIGINAL price will apply. **All Truecar price certificates will reflect ORIGINAL price** All prices advertised on any Credit union or third party lenders buying service facilitated by third party websites are original prices and not the discounted price. customer may choose to receive the discounted price if they pay for the vehicle with a preferred payment method. ** 2016 BUICK VERANO ** ONE OWNER ** LOW MILEAGE ** LEATHER ** PREMIUM INTERIOR FINISHING ** NAVIGATION BY TELEMATICS ** High Value Options Back-Up Camera Bluetooth Connection Climate Control Multi-Zone A/C Navigation from Telematics Satellite Radio Tire Pressure Monitor WiFi Hotspot ** AND MANY MORE FEATURES ** FINANCING AVAILABLE ** CALL 813-621-7799 ** ************* ORIGINAL PRICE ************* **To receive the lower advertised price or Preferred Payment discounted price purchaser must purchase the vehicle using one of the following preferred payment methods: Cash, Cashiers Check without lien recording instructions, Capital One Auto Navigator pre approval, or Financing through the dealership with an Approved lender. **YOU MAY CONTACT THE DEALERSHIP FOR A LIST OF APPROVED LENDERS **. A list of approved lenders maybe requested by email or talk to a sales representative. If buyer is purchasing the vehicle using any other payment method ORIGINAL price will apply. **All Truecar price certificates will reflect ORIGINAL price** All prices advertised on any Credit union or third party lenders buying service facilitated by third party websites are original prices and not the discounted price. customer may choose to receive the discounted price if they pay for the vehicle with a preferred payment method. ** 2016 VOLKSWAGEN JETTA SE w/CONNECTIVITY ** SUNROOF ** LEATHER SEATS ** APPLECARPLAY READ MORE ABOUT THIS JETTA BELOW The Jetta lives up to its German pedigree with an eminently stable and planted demeanor. Quiet and comfortable at highway speeds, its a solid road-trip companion that doesnt mind being hustled down a back road. Light steering and good visibility combine with punchy turbocharged engine to make for a pleasant, responsive driving experience around town. The 2016 Jetta brushes aside the competition when equipped with the SE w/ Connectivity pkg as it gives the buyer the most for their buck when it comes to Standard options which include Premium Leatherette Upholstery, Power Sunroof, 16-inch alloy wheels, push-button start, heated windshield washer nozzles, heated front seats and a front center armrest. a leather-wrapped steering wheel, driver lumbar adjustment,a rear center armrest and a six-speaker sound system with an enhanced Car-Net system.a rearview camera, a 6.3-inch touchscreen, a USB port, a media player interface, satellite radio and VW Car-Net smartphone integration, which includes Apple CarPlay and Android Auto integration which allows you to use many of your smart phone features on the vehicle touch screen such as your phone Navigation. As always the selection and pricing at EVO Motors is unbeatable with optional extended coverage available on all vehicles you can own this luxurious European Sedan and choose the protection level that fits your driving habits of up to 7 years and 150k additonal miles. If you are looking for a late model Low mileage Jetta EVO is your best choice. Visit today Back-Up Camera Bluetooth Connection Heated Front Seat(s) Keyless Start Satellite Radio Smart Device Integration Tire Pressure Monitor ** AND MANY MORE FEATURES ** FINANCING AVAILABLE ** CALL 813-621-7799 ** ************* ORIGINAL PRICE ************* **To receive the lower advertised price or Preferred Payment discounted price purchaser must purchase the vehicle using one of the following preferred payment methods: Cash, Cashiers Check without lien recording instructions, Capital One Auto Navigator pre approval, or Financing through the dealership with an Approved lender. **YOU MAY CONTACT THE DEALERSHIP FOR A LIST OF APPROVED LENDERS **. A list of approved lenders maybe requested by email or talk to a sales representative. If buyer is purchasing the vehicle using any other payment method ORIGINAL price will apply. **All Truecar price certificates will reflect ORIGINAL price** All prices advertised on any Credit union or third party lenders buying service facilitated by third party websites are original prices and not the discounted price. customer may choose to receive the discounted price if they pay for the vehicle with a preferred payment method. ** 2017 CHEVROLET CRUZE LT ** ONE OWNER ** BACKUP CAMERA ** WIFI HOTSPOT ** NAVIGATION ** This Chevrolet Cruze is a great family car with a reliable and powerful 1.4L Turbocharged 4 cylinder engine that is great on gas and easy on the wallet. Just look at these High Value Options: Back-Up Camera, Bluetooth Connection, Heated Front Seat(s), Keyless Start, Navigation from Telematics, Power Driver Seat, Satellite Radio, Smart Device Integration, Tire Pressure Monitor, WiFi Hotspot, AND MORE ** FINANCING AVAILABLE ** CALL**813-621-7799 ************* ORIGINAL PRICE ************* **To receive the lower advertised price or Preferred Payment discounted price purchaser must purchase the vehicle using one of the following preferred payment methods: Cash, Cashiers Check without lien recording instructions, Capital One Auto Navigator pre approval, or Financing through the dealership with an Approved lender. **YOU MAY CONTACT THE DEALERSHIP FOR A LIST OF APPROVED LENDERS **. A list of approved lenders maybe requested by email or talk to a sales representative. If buyer is purchasing the vehicle using any other payment method ORIGINAL price will apply. **All Truecar price certificates will reflect ORIGINAL price** All prices advertised on any Credit union or third party lenders buying service facilitated by third party websites are original prices and not the discounted price. customer may choose to receive the discounted price if they pay for the vehicle with a preferred payment method. ** CLEAN CARFAX ** 2017 VOLKSWAGEN JETTA 1.4 T **TURBO CHARGED ** High Value Options Back-Up Camera Bluetooth Connection Tire Pressure Monitor Stylish and fuel efficient. It's the perfect vehicle for keeping your fuel costs down and your driving enjoying up. One of the best things about this Volkswagen Jetta is that it has low, low mileage. It's ready for you to truly break it in. More information about the 2017 Volkswagen Jetta: The 2017 Jetta competes with the Honda Civic, MAZDA3 and Toyota Corolla. Volkswagen has worked to give buyers the best of all worlds-- carefully packaging features and tweaking the Jetta's price level. Volkswagen wants buyers to feel they can get a premium German sedan or wagon at a friendly price, with fit and finish similar to that on cars that cost two and three times as much. Strengths of this model include good handling and braking, Affordability, excellent fit and finish, fuel economy, and terrific trunk space. ** AND MANY MORE FEATURES ** FINANCING AVAILABLE ** CALL 813-621-7799 **To receive the lower advertised price or Preferred Payment discounted price purchaser must purchase the vehicle using one of the following preferred payment methods: Cash, Cashiers Check without lien recording instructions, Capital One Auto Navigator pre approval, or Financing through the dealership with an Approved lender. **YOU MAY CONTACT THE DEALERSHIP FOR A LIST OF APPROVED LENDERS **. A list of approved lenders maybe requested by email or talk to a sales representative. If buyer is purchasing the vehicle using any other payment method ORIGINAL price will apply. **All Truecar price certificates will reflect ORIGINAL price** All prices advertised on any Credit union or third party lenders buying service facilitated by third party websites are original prices and not the discounted price. customer may choose to receive the discounted price if they pay for the vehicle with a preferred payment method. If you want your crossover to be a rewarding driving machine, the Volkswagen Tiguan should hit the spot. When you compare similar vehicles in its class the Tiguan Should be on top of your list because of Standard options, Spacious interior, confident eager turbocharged power, an unusually composed driving feel and price. For the 2016 model it comes with Premium Leatherette Interior. Heated front seats, Push start button, Bluetooth wireless. 16-inch alloy wheels, roof rails, heated mirrors, automatic headlights and wipers, keyless ignition and entry, cruise control, air-conditioning with rear seat vents, touchscreen interface radio, a tilt-and-telescoping leather-wrapped steering wheel, a sliding and reclining backseat, a rearview camera, a 5-inch touchscreen, Bluetooth phone and audio connectivity, and an eight-speaker sound system with a CD player, auxiliary audio jack, a USB port and a media player interface. When it comes to driving experience the Tiguan has a lot of positive attributes. The seating position is high, seemingly higher, in fact, than many rivals, providing that tall, commanding view of the road ahead. There's also a responsiveness and indisputable Germanic refinement to the Tiguan that makes it more pleasurable to drive than the typical small SUV. Hit the gas and the standard 200-horsepower turbocharged four-cylinder engine delivers energetic acceleration that's among the quickest in the segment. We carry a large selection of Tiguans and many other similar SUVs our volume pricing is one of the lowest you will find Nationwide. Also optional extended coverage available on all vehicles you can own this European SUV and choose the protection level that fits your driving habits of up to 7 years and 150k additional miles. All plans come with road side assistance for the length of the plan, Transferrable to future owners. Visit today and t ake advantage of super aggressive pricing on all Tiguan Models ************* ORIGINAL PRICE ************* **To receive the lower advertised price or Preferred Payment discounted price purchaser must purchase the vehicle using one of the following preferred payment methods: Cash, Cashiers Check without lien recording instructions, Capital One Auto Navigator pre approval, or Financing through the dealership with an Approved lender. **YOU MAY CONTACT THE DEALERSHIP FOR A LIST OF APPROVED LENDERS **. A list of approved lenders maybe requested by email or talk to a sales representative. If buyer is purchasing the vehicle using any other payment method ORIGINAL price will apply. **All Truecar price certificates will reflect ORIGINAL price** All prices advertised on any Credit union or third party lenders buying service facilitated by third party websites are original prices and not the discounted price. customer may choose to receive the discounted price if they pay for the vehicle with a preferred payment method.